Thread: Are Hope Tech M4's really worth the $$? I've read nothing but good things and the occasional post saying that some setups are as good and better due to the $ difference. I know there are several setups out there that are capable (Stroker Ace, Saint, Formula, etc) but the Hopes just look so damn nice and I grew up on dirt bikes so the comparison to Motocross brakes makes me wonder. It seems this is again a post asking for guidance / counseling / arm-twisting to spend all of my damn $ on sick bling parts. I am stuck recovering from a Compartment Syndrome after a nice shin blast on a downhill run at Diablo Freeride Park in Vernon, NJ so obsessing is unavoidable. Will be going on a new Blur LT2 with a Fox 36 up front riding aggressive trail / all mountain type stuff. . .
"The only way to see this, is to come out here and see it." I don't have the M4's but I do have the Tech x2's. I can say they have been great. I have done nothing to them except adjusting the reach after the pads have been worn in alittle. I went the extra and bought mine with the SS line and the Blue floating rotors. Nothing but good and lots of comments. Shop around you might find them cheap somewhere. Totally worth the cash. Certainly the best feeling brake I have ever ridden - currently running tech M4's, Elixir CR's, and Marta SLs(and have ridden and owned many others). The modulation with these brakes is like none other and they have the power when you need it - most other current brakes have a very on/off feel to them; these do not. They are also super quiet when dry. JensonUSA and chainreactioncycles both have really good deals on the Tech M4's right now - you could probably get away with running the Tech X2 on the rear, if you want to save a little cash(and a little weight). I'm trying to reduce / eliminate the need to ponder upgrades in the future once I finish building this new beast. I figure if I go the distance and get the best I will hopefully never need a change. Have had a set of the Elixir R SL's on my Heckler that have been fantastic until I really started pushing them on back to back steeps and I have started to encounter a bit of fade on the front that new different types of pads (organic / sintered) as well as a few bleeds has not taken care of. Might need a new brake all together as I have read many posts regarding various things that it could be. . . So, the shiny aluminum of the Hopes has started to haunt me. Good thinking on the X2's on the rear. 75% of braking is up front so it seems you wouldn't need the 4 piston setup in the rear for the Trail / All Mountain stuff. I'm in a similar boat. I broke my collar bone a month ago, so now I have nothing to do but sit around and look for stuff to buy for my bike. I have a friend with the M4s on his bike, and I will say the last time we swapped bikes that was the one thing that stood out that I really liked. I was running Avid Juicy 5s at the time, so they ought to be a big step up from those. I got a different bike since then with XTRs (975). While I think the XTRs are "okay" I do feel like the brakes are the weakest part of the bike. I have been looking at the M4s (check out wiggle.com) but I have a hard time spending that much on brakes. I think I want to try my buddy's bike again to see if I can convince myself that they are that much better than the XTRs. The M4's do look sweet, but looks don't slow me down very well. I will say that the use of DOT brake fluid is a big plus in my book. Finding mineral oil for Shimanos is not cheap. The M4's are the best brakes I've used. I switched from the original version of the Formula Ones and the Hopes blow them away. The Ones had great stopping power but horrible pad wear, sticky pistons, way to long of a lever throw and were the worst I've ever owned to properly bleed. I know the Ones were redesigned so they may be much better now. Get the Hopes, you won't be sorry. Are they worth it? Yes. 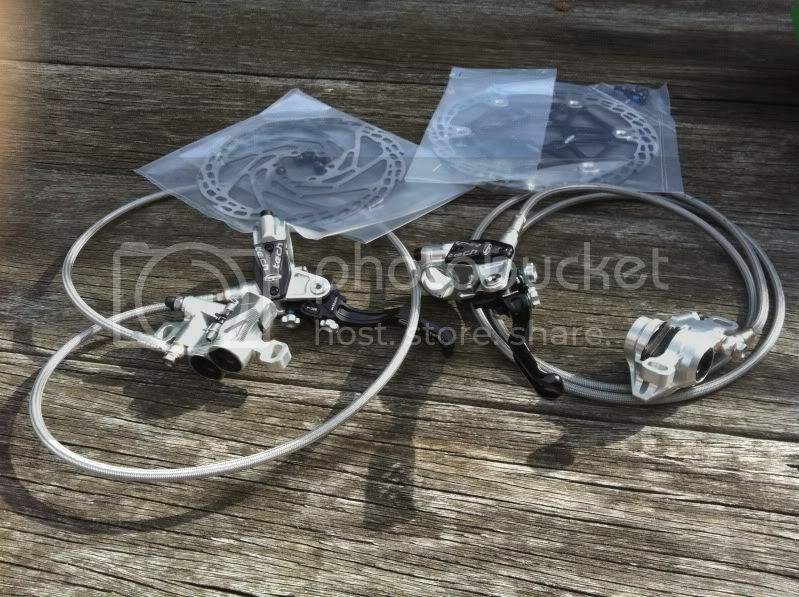 I just dropped the hammer and ordered up the M4's 183mm in the front regular hoses and rotor (all they had left short of the ones with braided hoses which I just don't think are necessary) and the X2 in 160mm regular hoses and floating rotor for the rear. Now all I need is a Floating rotor for the front and I'm good. Did the Wiggle email list shuffle and ordered them separately with 5 euro off of each order and free shipping to the US on both. Ended up being $330 total which I don't think I could ever beat considering the 2011's are coming in and the prices are going back up! I got Hope M4's about a month ago, and damn, they are better than any disk brakes I have ever used over my 20 years of riding! I just ordered the X2 in pink for my fiance! She is going to love her xmas present. Congrats on getting the best brakes! I just ordered the same setup from Wiggle. These are my first disc brakes, and I'm excited! Whats the Wiggle email list shuffle? Run the same setup on my Trail bike really a good combination for it. Oops. Did the USD conversion for Euros and not Pounds. I wish it was $330 it was more along the lines $395. Still not bad though.